Probably the answer is going to a Spanish-speaking country. But before going there it would be better for you to possess some language basics. The stronger the basics are, the easier and the faster you enjoy the advantages a language might give you. So let's get down to the heart of the matter with this course for beginners! It doesn't matter if you're a student, a worker, a traveler, or just a linguistics-lover. This tutorial is for all the people who wish to study the language from the very beginning and to progress quickly and easely by self-learning. The A1 course is for you if you are brave enough to begin something new from the basics! The purpose of the course is to create a sequence of 19 articles ordered in different topics owing to highlight the most essential and necessary vocabulary for dummies. You will learn Spanish phrases and words with English translation, a lot of examples, audio, microphone for training your pronunciation and interactive exercises. After finishing the online course you are supposed to be acquainted with the basic Spanish vocabulary for level A1. By completing the course you will have learnt around 1000 phrases. Don't forget that the course suggests Spanish for English speakers which means that you'll get your results even faster and easier as everything is created especially for the English speaker! If you need additional help to improve your skills even more, you can contact one of our professional private teachers and request Skype lessons. It's fast, easy and relevant to your personal language level. Everything you need is Skype installed on your computer, headphones, internet connection and of course motivation. Or you'd better combine the self-learning course and the private lessons with a teacher for more efficiency. You decide what will be helpful for your personal goals! 1 The alphabet in Spanish How do you say the alphabet in Spanish? 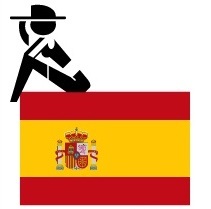 2 Spanish pronunciation rules Pronounce Spanish properly! 3 Introduce yourself in Spanish Preséntate en español! 4 Greetings in Spanish Meet Spanish people and greet them! 5 Telling the time in Spanish Do you have the Spanish time? 6 Counting in Spanish Learn to count in Spanish! 9 Weather in Spanish ¿Qué tiempo hace?